Hey folks! We are back with another set of Traffic stats to put in place for you; to analyze how good/bad DailyBlogging is doing in terms of traffic. This past month the post frequency got affected largely as my colleges & due to it, I wasn’t able to post like before. Still the rankings weren’t affected that badly. Though I frankly thought it would. In fact, 8 days ago we entered the Elite Alexa Club. That was the point I realized that we are on the right track. If you thought that just posting posts would fetch you good amount of traffic, then you’re wrong. In blogging many things like a good Social Media base, promoting the posts in the right way, blog commenting, relationship with good/even pro-bloggers,etc matters. With less time I have learnt the skill of writing a post & giving it a final touch much quickly than before. So everything happens for good. We have an increased Unique Visitors count as compared to the one in Augusts’ Traffic Stats. But rest all factors like bounce rate, page views, time on site have gone to a beating. I know it’s because of the low post frequency, but I can’t help it. I will try to keep up the post frequency to 4 per week. It’s difficult, but I will try to meet it. Now DailyBlogging gets about 150 UV’s on an average/day. I remember I had told, that my aim is to achieve 180 UV’s. We are getting closer but still that target seems a bit far. 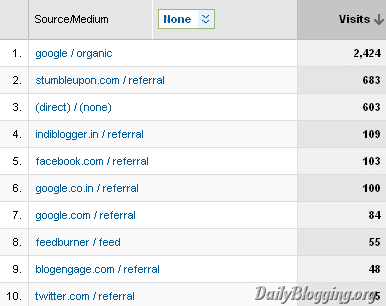 Organic traffic from Google shows it’s importance when it comes to maintaining a blog with a base of around 90 posts. If you’re good at SEO, then you can expect 100+ UV’s per day simply coming from organic traffic. 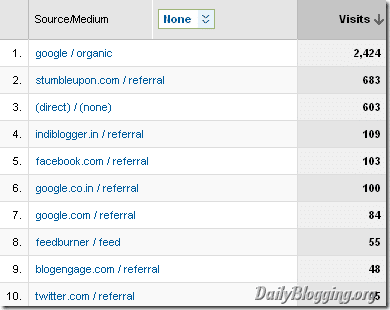 We have managed to get double of the organic traffic we used to get until last month. I already talked about DailyBlogging getting into the elite alexa club. So, one could imagine how happy I’m. 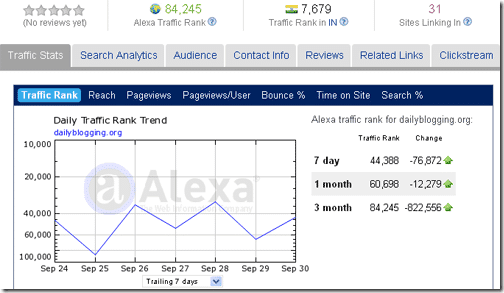 My next target for alexa would be to hit the 75,000 mark by the end of October. I know it’s a whole month. But I would be setting up easier targets from now on. It would mainly depend on the time I’m devoting to DailyBlogging. Once again a whole-hearted thanks to all my readers, people who show their love to this blog by sharing our posts, to the guest authors & our discussion makers – Blog Commentators. If you havn’t yet Subscribed to us, then do Subscribe to our RSS Feeds/Daily Updates to avoid missing some really interesting posts. Congratulations on your new milestone. Your good content and hard work is giving fruits now. Best of luck. nice stat… but you should take care of your bounce rate or will loose the position in SEO…. Well, an impressive traffic stats. Except the bounce rate everything is amazing. Try to reduce it Mani. Very impressive growth Mani.Wish you good luck. You have got some good stats there and I am sure that the stats will be improving with time. word of caution: do take care of bounce rate! Nice to see that you get most of the traffic from google. And Congratulations on entering the Alexa Elite Club! 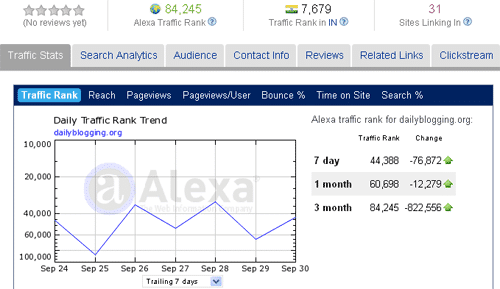 Nice Stats as most of your traffic is from Search Engines, You are going to rock the world for sure! Keep on applying the good work. You will see the best days asap! Thanks for the appreciation TheWebTricks! Nice stats buddy, 😀 Congratz..
Hey, Nice stats.. even i got 6000+ visits for my second month of the website ..